Once upon Lijiang, Yunnan China, as the top 10 hiking destination, you will never miss the Tiger Leaping Gorge. In the hikking process, you will through some of the most naturally beautiful and diverse landscapes in a close and far distance period. About 100 km north from Lijiang, Tiger Leaping Gorge is precisely located between the Jade Dragon Snow Mountain (玉龙雪山, in the Yulong Naxi County, part of the city-prefecture area of Lijiang) and the Haba Snow Mountain (哈巴雪山, in the the Shangri-La County, part of the Diqing prefecture). Tiger Leaping Gorge is spectacular and crown as the deepest gorge in the world. 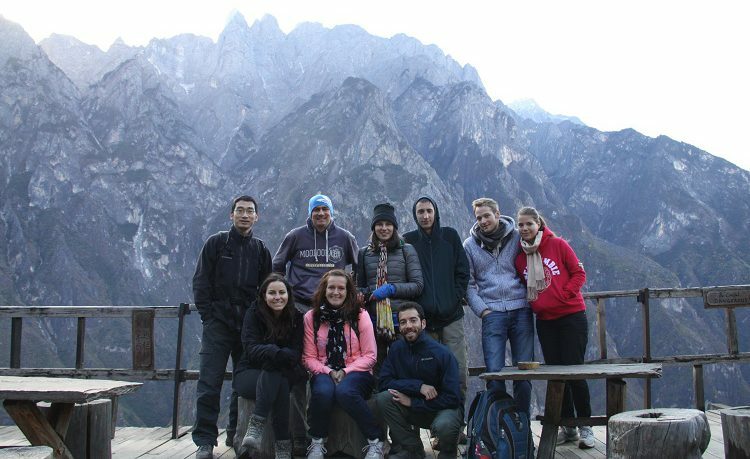 Foreign backpackers started hiking in the area in the 1980s and now Tiger Leaping Gorge Hiking Tour has been one of the most famous hiking tour all around the world. 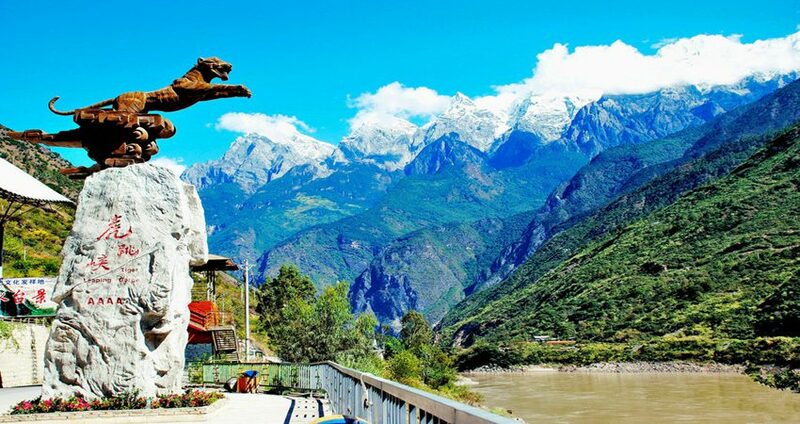 From the top of Tiger Leaping Gorge, you can look down the steeply angled (70-90 degrees) mountain sides to the rushing Jinsha River with its 18 frothing rapids more than 200 meters below. Naturally Tiger Leaping Gorge is divided into three sections: Upper Tiger Leaping Gorge, Middle Tiger Leaping Gorge and Lower Tiger Leaping Gorge. 9km away from the Tiger Leaping Gorge Town, is the narrowest part of the whole gorge. 5 km from the upper section. “Mantianxing”reef area is the most dangerous area. There is a giant gully with about 1km depth, this part is close to the exit of the gorge. It is said that a hunter was chasing a tiger through the gorge many years ago. When it reached the narrowest point the tiger leapt across the Jinsha River, escaping the furious hunter. The rock where the tiger made its jump is now an iconic viewing point. 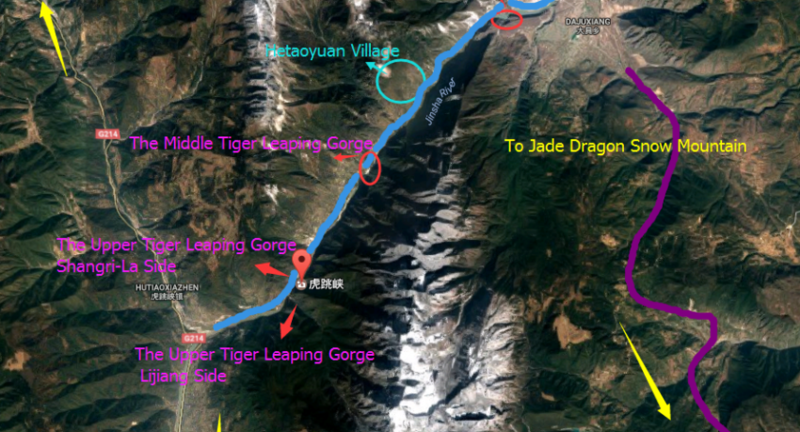 There is another legend that a rich Lijiang ruler, Lord Mu, rode on his tiger to go along the side of Jinsha River one day. He and tiger went to a relatively narrow area, the tiger leaped to a large rock in the center of the river. The tiger landed but Lord Mu was not landing at the same time and had dropped into a rolling river. Time has passed, there left a tiger leaping stone for future generations. This sight is located more than 500 meters vertically down from Tina’s Guesthouse. Daju is situated past Walnut Grove at the northeast end of Tiger Leaping Gorge, on a large flat shelf of land on the opposite side of the Jinsha River from the Tiger Leaping Gorge trails. All of the guesthouses provide local food and simple western food because it has been a long history of Tiger Leaping Gorge hiking for international tourists.These tourists taught local people how to cook western food with local food.So it is very convenient to enjoy very nice food along the Tiger Leaping Gorge.